Republican Governor Terry Branstad has been confirmed to be U.S. Ambassador to China. Eighty-two U.S. Senators voted for Branstad’s nomination and 13 Democrats voted no late this afternoon. Branstad will resign as governor on Wednesday morning and Lieutenant Governor Kim Reynolds will be sworn in as Iowa’s 43rd governor. Maryland Senator Ben Cardin is the ranking Democrat on the Senate Foreign Relations Committee and he praised Branstad during remarks on the Senate floor before the confirmation vote was taken. “I had a chance to meet with him in my office and I must tell you I was extremely impressed about how he was prepared to move on to be the ambassador to China and how he spoke in favor of our strong ideals,” Cardin said. Iowa Senator Chuck Grassley picked up on that theme during his brief remarks about Branstad. “I have no doubt that he will stand strong for American values such as freedom of the press and religious liberty and work to strengthen peace, stability and prosperity between our two nations,” Grassley said. 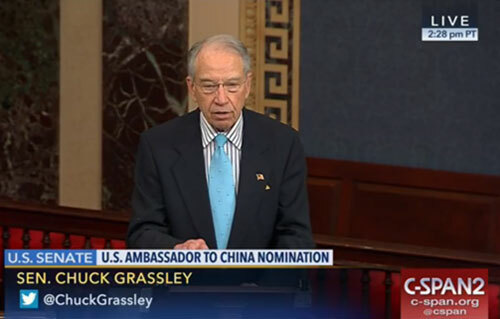 Grassley also stressed Branstad’s tenure as the nation’s longest-serving governor. Joni Ernst, Iowa’s other U.S. 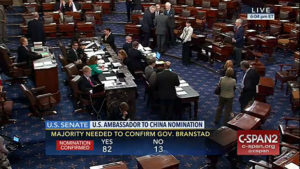 Senator, said Branstad will be an “effective advocate” for U.S. interests in China. “Iowa’s extensive trade relationship with China has given Governor Branstad a front-seat view of the complexities of our country’s broader trade and economic relationship with China,” she said. Ernst also mentioned Branstad’s long-standing relationship with the man who is now China’s president after their initial meeting in Iowa back in 1985.